It was a tight game. They had lots of different things they would throw out there, so yeah, we did use lots of different combinations tonight. We were certainly careful with the Pettersson line. All the lines were playing pretty good for them, and Horvat takes a lot of draws. We had to pay special attention to both those lines. Yeah, they’ve played well. Kopitar has been excellent the last two games. Brownie’s been scoring, which is nice. But all the guys played hard tonight. We have some young guys, they maybe made a couple little mistakes, but they’re going to learn from it, and that’s what they need is games like this to get better. A little bit. We’d like to be scoring on the power play. I think we have to score power play goals if we’re going to be successful. We played pretty close all the way through, though. He’s been good. He made a couple saves that first period, like outstanding saves. That could change the way the game went. And he’s pretty calm. For a young guy to come in and do that, that’s impressive. They were both elite players. Carter was there, too. They’re hard to play against, and you know every shift that Kopitar’s going to come out and go hard. He’s been a force all year. They’re two good players, and you always know when they’re on the ice. I would’ve liked to have been a little bit more aggressive, but their D played well. I thought Biega carried the play, I thought he had a good night. We’d have liked to have been a little more, but at the same time, we didn’t give them an awful lot. Vancouver always means something different to me than other clubs I think whenever you come back in here. Lots of good guys in that room over there, and I know that, and I know they hate to lose, as well, but I certainly like to win. Kopi just mentioned to me before the draw to come over the top for help because he had been winning draws, but not far enough back against Horvat. He’s been winning 2-3 feet behind him and that’s exactly what happened and I scooped the puck up. The way they had been lining up on the draw they had their D back behind Horvat so Kopi went to the net and took Horvat with him and that gave me and Marty a good opportunity up top. Boeser got caught in between, it’s a tough play to read, and I slid it over to Marty and Marty had a nice shot and it landed nice and flat for me and I just had to put it in. If you go around the net that’s where you are going to score the goals. Other than an empty net that’s probably my farthest goal away from the net is maybe seven feet but that’s where you have to go to score goals in this league. I guess you are seeing more goals from further out, but those guys are elite goal scorers so a player like me has just got to get to the net and pucks will be laying there if you are willing to stay in there. This might be the first time we’ve won two in a row. We’ve got to build it and its probably more important — it’s two division wins –because the position we’re in, it’s the only way we are ever going to get back in is if we beat our division teams. If you look at the math and the way it works out over the course of the season, these division games are pretty much life and death for us. The biggest thing for me with Cal is he made some big saves for us, but he is really super calm in net and I think that helps. Even from a young guy it has an effect on the team when you have a guy who doesn’t get flustered or when a goal goes in he just resets and goes. That’s a big part of Quickie’s game and Cal has a lot of that calmness in net that I think kind of helps our team not panic. It was bang-bang, I kind of overplayed the original play and that kind of put me out of position and luckily I was able to get over there and get something on it but originally I kind of put myself in a bit of a bad position but I’m glad it worked out. The whole time it was our game to win and I think it was just a matter of time really. Obviously when they get one that late in the game, it could be deflating but I think we have been through too much as a team to let stuff like that continue to bother us. It showed in the overtime. We controlled the play and luckily we were rewarded. A little bit of credit goes to them, they were a desperate team and we knew they were going to come in the third period, but we also locked it down pretty good. They got some opportunities, but I don’t think there was a ton of grade-As or anything that was unstoppable. Even though they spent a good amount of time in our zone I still think we did our job and locked things down a little bit. –With the win, Los Angeles improved to 111-105-36 all-time against Vancouver, a record that includes a road mark of 44-62-18. 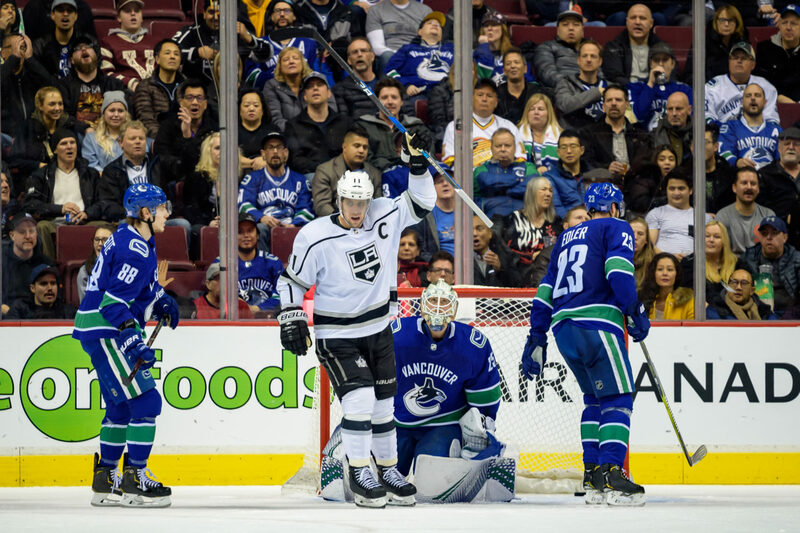 The Kings improved to 1-1-0 in the season series with games remaining on February 14 at Staples Center and March 28 at Rogers Arena. –Los Angeles improved to 5-8-1 against the Western Conference, 3-2-1 against the Pacific Division, 3-2-1 in one-goal games, 8-2-0 when scoring first, 5-5-0 when tied after the first period, 7-1-0 when leading after the second period, 2-1 in games that extend past regulation, 1-1 in games decided in overtime and 7-8-1 when outshot by their opponent. –The Kings lead the league with 34 overtime wins since the shift to three-on-three overtime prior to 2015-16. With a record of 34-15, their .694 overtime win percentage over this span ranks third behind Vegas (.714) and Calgary (.711). Dustin Brown recorded his eighth career regular season overtime goal. He had one in 2007-08, one in 2008-09, two in 2009-10, three in 2017-18 and now one this season. –Matt Luff’s goal streak ended at four games. –Tyler Toffoli played his 399th career game. –Alex Iafallo played his 99th career game. –Los Angeles attempted 49 shots (25 on goal, 16 blocked, 8 missed). Vancouver attempted 62 shots (33 on goal, 18 blocked, 11 missed). Derek Forbort, Alex Edler and Ben Hutton tied with a game-high four shots on goal. –The Kings won 32-of-52 faceoffs (62%). Adrian Kempe won 1-of-5, Anze Kopitar won 9-of-14, Ilya Kovalchuk won 1-of-2, Nate Thompson won 8-of-13, Dustin Brown won 1-of-1 and Jeff Carter won 12-of-17. They have won a majority of faceoffs in 18 of 24 games this season.